This week potato farmers gathered in Olympia meeting with state legislators, staff members, and agency personnel. Family potato farm perspectives were shared, communicating various challenges, and expressing the need to fund soil health research. The Washington State Soil Health Initiative provides a win-win opportunity for potato growers, the environment, and local communities. Growers also supported the recommendations of the bipartisan Pesticide Application Safety Workgroup emphasizing the need for dedicated funding to expand pesticide and applicator training at the Washington State Department of Agriculture. Growers also shared their concerns with some of the carbon and energy proposals. Establishing carbon and energy fees would, directly and indirectly, impact potato production in Washington, making it difficult to compete in the low-margin global marketplace. Potato processing is energy intensive and trade exposed. Agriculture has a major economic impact in our state, contributing not only $7.4 billion to the economy but also providing 36,000 jobs. 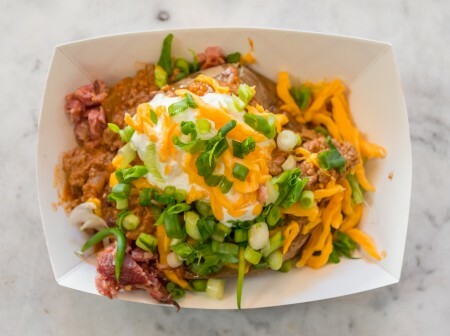 Potato farmers were proud to serve over 1,600 baked potatoes allowing our growers to connect with people from each of Washington’s 49 legislative districts. Olympia Potato Day continues to be one of the most popular days during each year’s legislative session.